So what’s a guy to do when he doesn’t like his options? MAKE A NEW OPTION… What else should we as developers do, am I right? 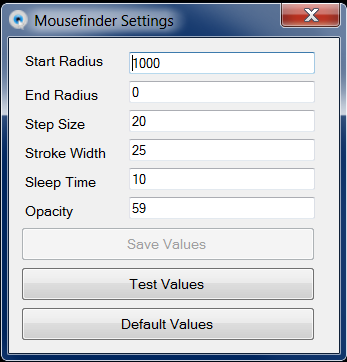 So, I went ahead and made a mousefinder of my own, with 6 separate settings to change the effect. 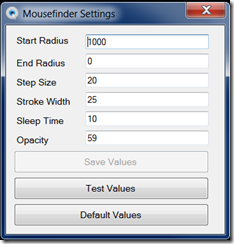 I am releasing it here for anyone else that may also have problems finding their mouse at times. Multiple options to change to achieve the exact effect you want. 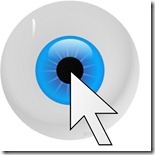 If your mouse moves while it is honing in, it will hone in on its current position. Many times, I would press the button and move my mouse at the same time, and many times, the mouse happened to be at a screen edge, so I would miss it. This program will restart its animation on a new screen if the mouse changes its screen while playing. Stylish color changing from green to red. Deployed as a ClickOnce, so easy to remove if you don't like it. Application lives in notification area so that you can easily reach configuration or close it. To get it to run on startup, copy its application shortcut from its startmenu directory to the “Startup” folder in your startmenu. I understand if you don’t download this… You don’t know me and I don’t know you. I can only say that I have honestly NOT added any virus’ or malware to the package. Finally, if you do use this application - please leave a comment, or email me and tell me what you think of it. Encounter a bug or hashes no longer match? I want to know that too!